The NAB consists of six modules: a Screening Module and five domain-specific modules - Attention, Language, Memory, Spatial, and Executive Functions. Each of the six NAB modules is self-contained and may be administered independently of the other modules. The NAB can be purchased as individual module kits versus packaged as a complete kit, thus allowing the clinician increased flexibility to focus on specific areas of concern. Additionally, each NAB module has two equivalent, parallel forms (Form 1 and Form 2) that were created and normed simultaneously with identical task/content specifications and development methodology. On this page we list just one kit and one pack of record forms per module, however we do sell all components of the full spectrum of the NAB. Please contact orders@hogrefe.co.uk to enquire about any component not listed on this page. The NAB Screening Module helps to generate initial hypotheses regarding differential diagnosis and treatment recommendations. It provides an estimate of the examinee’s functioning in a particular domain when more in-depth examination is either not warranted or not possible. The NAB Attention Module provides a marker of an individual’s attentional capacity, working memory, psychomotor speed, selective attention, divided attention and information processing speed. Examination of an individual’s performance on the NAB Attention Module will provide clinically useful information for patients with traumatic brain injury; disorders involving the subcortical, frontostriatal systems and/or brainstem (e.g. Parkinson’s disease, Huntington’s disease, HIV-associated cognitive-motor disorders, multiple sclerosis); anxiety disorders and adult residual attention-deficit/hyperactivity disorder. The NAB Memory Module provides a marker of an individual’s verbal explicit learning, visual explicit learning, verbal delayed free recall, visual delayed recognition memory, and verbal explicit learning and recognition of information likely to be encountered in day-to-day living. 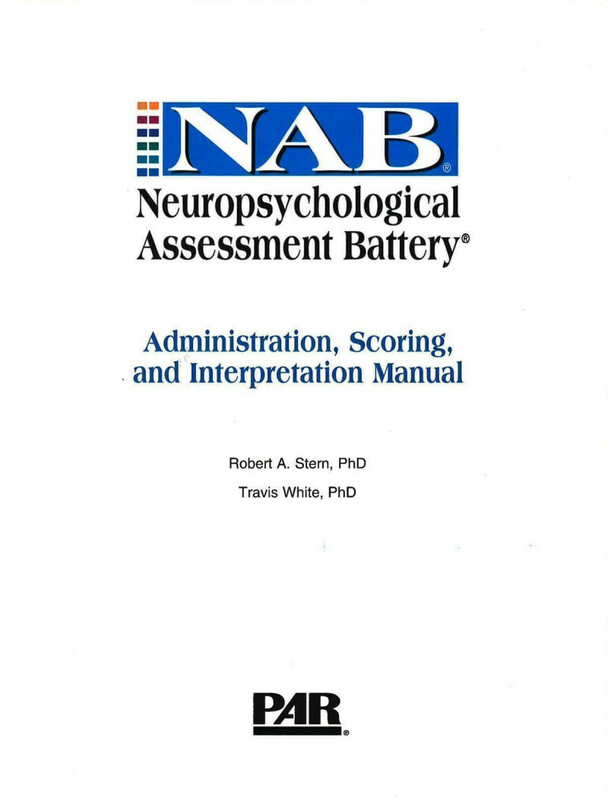 Examination of an individual’s performance on the NAB Memory Module will provide clinically useful information for patients with Alzheimer’s disease, frontotemporal dementia, strokes or aneurysms involving the anterior communicating artery, hypoxia/anoxia, Korsakoff’s syndrome, traumatic brain injury, neurotoxic exposure, electroconvulsive therapy, major depression, mesial temporal sclerosis, herpes encephalitis and other lesions (e.g., vascular, degenerative, epileptic, neoplastic, traumatic,metabolic, surgical) involving mesial temporal lobe structures. The NAB Spatial Module provides a marker of the examinee’s visuoperceptual skills, attention to visual detail, visuoconstruction, right-left orientation, topographical orientation, and visual scanning. Examination of an individual’s performance on the NAB Spatial Module will provide clinically useful information for patients with a lesion in the right hemispheric parietal lobe, frontal systems involvement, and/or occipital lobe involvement. The NAB Executive Functions Module provides a marker of planning, engaging with others effectively, problem solving, successfully interacting with the environment to get one’s needs met, judgment, conceptualisation, cognitive response set, mental flexibility, verbal fluency, and generativity. Examination of an individual’s performance on the NAB Executive Functions Module will provide clinically useful information for patients with traumatic brain injury, stroke, tumour, hypoxia/anoxia, degenerative disease (e.g. Parkinson’s disease, Pick’s disease, frontotemporal dementia, Huntington’s disease, advanced Alzheimer’s disease); attention-deficit/hyperactivity disorder, depression, schizophrenia, obsessive compulsive disorder, metabolic disorders (e.g., Graves’ hyperthyroidism, hypothyroidism), and other lesions (including vascular, degenerative, epileptic, neoplastic, traumatic, metabolic, surgical). Learning to use the NAB is made easy by the NAB Software Portfolio and the NAB Training Program, which are included with each Module Kit. The NAB-SP automates many of the steps involved in calculating raw scores as well as obtaining normative scores (e.g., z scores, T-scores, percentiles) and generating profiles, all in a fraction of the time required by hand scoring. It includes built-in,easy-to-use report editing features, and it generates profile graphs with the ability to overlay profiles from prior NAB administrations for a specific client. Reports can be exported to common word processing programs, and client data can be exported tomany spreadsheet and database programs. The Training Program on the Administration and Scoring of the NAB Module Kit is designed to facilitate learning the correct administration and scoring procedures for the NAB Module you have purchased. The specific module DVD contains an overview of the module you ordered; it is organised into chapter titles that correspond to the individual tests within the module, thus facilitating easy navigation to information about a specific test. Each chapter includes an overview of the specific test followed by a demonstration of a standard administration.